…Beside the tree a hand-lettered sign reads: “Celebrate the majestic life and mourn the tragic death of this ancient Douglas fir: POSTPONED.” The roadside tree has fallen victim to a rot-causing fungus, phaeolus schweinitzii, and the Saanich parks department had deemed that is should be removed, given its size and location in an area prone to high winds. Funke-Furber then hired her own arborist to conduct an independent review of the health of the tree, a process that netted her the same result as Saanich’s testing. A volatile market has created serious challenges for the Canadian forest products industry. The U.S. housing market slowdown, global economic instability, the rise of digital media and the decline in the U.S. dollar have had a dramatic impact, so industry participants are rethinking their strategic direction and discovering new opportunities. The watchwords of the day are sustainability, accountability, product innovation, production efficiency and cost-cutting. Producers are also turning to new markets to counteract shortfalls created by revenue declines from established customers. The United Steelworkers is calling on the provincial government to order a formal review of responsibility among safety agencies for two northern B.C. sawmills where explosions earlier this year killed four workers. The union, which represents workers at Babine Forest Products in Burns Lake and Lake-land Mills in Prince George, said Thursday the request was sparked by recent Vancouver Sun stories detailing the lack of coordination on safety between agencies for the two sawmills. A Sun story Monday revealed Babine Forest Products had not been visited by fire inspectors under the federal or provincial fire code for years, and possibly never, before a deadly explosion and fire on Jan. 20. The investigation into the fire that destroyed a Ruskin cedar shake mill indicates it may have been electrical in nature. The blaze started shortly after midnight Sunday at the Waldun Forest Products mill on 287th Street and Lougheed Highway in Ruskin, near the Mission border. Investigators from the Maple Ridge Fire Department believe the fire started in an area of the mill where maintenance work was being done Saturday. Time to sweep out the cobwebs and grease up the equipment at the former NewPage Port Hawkesbury mill. A Nova Scotia Supreme Court judge granted an order Thursday allowing $2 million to be spent ramping up the Cape Breton paper mill. The approval gives prospective mill buyer Pacific West Commercial Corp. the green light to bring back laid-off workers, order materials and supplies and prepare the mill for a quick restart. The $2-million fund includes $500,000 from Pacific West, $1.2 million from the province’s existing financial assistance fund to keep the mill in a hot-idle state and a $300,000 contingency fund the province previously earmarked for Pacific West to spend on marketing. WESTVILLE — The one sector of the province’s forest industry that hasn’t required large-scale government subsidies is being hampered by an inability to access high-value softwoods and hardwoods. And it’s not because of a lack of supply. A 2008 Natural Resources Department State of the Forest report points to an increasing amount of white pine, sugar maple and yellow birch, enough to meet the needs of the province’s relatively small, high-value, woods industry. August 27, 2012: Robert Fawcett, Director of Forestry Relations, J.D. Irving, Limited talks about the company’s committment to buy private wood from New Brunswick wood producers. A fire in the boiler room at Bennett Lumber in Princeton has been contained and the boiler reactivated after dry fuel burned back and through the upper feed system, according to Brett Bennett, company vice president. The fire started around 9 a.m. today and caused several thousand dollars in damage, said Bennett, but was contained quickly by the company’s fire brigade with assistance from Potlatch and Moscow firefighters. Tasmanian forest products company Gunns has reported a net loss of $904 million for the past financial year. This compares to an almost $356 million loss for the previous 12 months. The company blamed the costs associated with a major restructure and the state of the export woodchip market, which forced significant write-downs of forestry assets and its pulp mill project. Gunns told the stock exchange that underlying earnings for the period were nearly $30 million, down from nearly $42 million in the previous 12 months. Stora Enso Building and Living has today acquired UPM Kymmene’s 50% shareholding in the sawn timber trading company RETS Timber Oy Ltd. The acquisition makes Stora Enso Building and Living the sole owner of RETS Timber. The transaction is effective immediately. RETS Timber is a leading European softwood sawn products supplier to the Middle East and North Africa. The Tasmanian government has confirmed its once-powerful logging business will be stripped to its core in a desperate attempt to stem huge losses. The major restructure, recommended by independent consultant URS, was leaked in a Forestry Tasmania (FT) email on Tuesday and confirmed by the minister responsible, Bryan Green, a day later. Under the plan, FT’s non-commercial operations, such as the management of forest reserves, will be taken over by government departments. Exports of Finnish softwood lumber and planed goods in May 2012 showed year-on-year decline of roughly 7% to 588,000 m³. According to Finnish Forest Industries deliveries to other European countries were also down by roughly 7% to 997,000 m³. Forestry Tasmania’s Ken Jeffreys talks about the leaked email. Listen for more. The Finnish forest industry production volumes decreased or remained unchanged in a challenging operating environment during the first half of 2012. The industry’s cost-competitiveness must be safeguarded in difficult economic times. “The Government’s end-of-August budget talks must come up with concrete measures that protect the competitiveness of Finland’s forest-based sector. The cost impact of, for example, the Sulphur Directive, must be compensated in full. Other necessary fast-acting measures include the relinquishing of shipping lane charges and the introduction of a diesel tax refund system for heavy transports. Forestry Tasmania has thrown into question the value of the State Government’s proposal to break up the business. The Government is exploring how to carve up the company’s commercial and non-commercial functions, including whether a government department take control of the state’s 1.5 million hectare forest estate. …But Forestry Tasmania’s Ken Jeffreys says the review shows the huge overhaul will create few savings. WHEN life hands you lemons, goes the old saw, make lemonade. But what if life should hand you 18m hectares (44m acres) of dead trees? That is the problem faced by the province of British Columbia in Canada, which could lose over half its pine trees to the depredations of the fearsome mountain pine beetle. …So, to deal with the problem, in 2009 British Columbia’s parliament passed a Wood First Act that requires wood to be considered as the primary construction material in all new buildings erected with public money. Residential flooring sales were brisk in the U.S., and prices for most unfinished strip flooring items edged up again last week. Several flooring plants in the South and Appalachian Area 1—facing heavy competition from one another as well as from truck trailer flooring plants—raised green lumber purchase prices. Interestingly, one strip flooring manufacturer temporarily shut down because its margins became too thin; “We plan to sell flooring at a profit and not a loss.” Lumber purchasing by truck trailer flooring plants was quite good. VICTORIA – New guidelines specifying the qualifications of falling supervisors will improve safety for those working in the woods. Effective April 1, 2013, all forestry-related falling activity under a Ministry of Forests, Lands and Natural Resource Operations contract must have a designated falling supervisor, although the supervisor does not need to be at the site at all times. Slow and steady usually wins the race, but opponents to the planned logging in the Cold Creek area believe it does not matter how slowly the trees come down, the end result is a clearcut hillside. Island Timberlands has plans to start logging operations in the Cold Creek area, between Coombs Country Candy and the Lookout, in mid-September, depending on the fire risk in the area. Morgan Kennah, manager of sustainable timberlands and community affairs for Island Timberlands said during the harvesting time they will be closing the recreational trails. After reading “Forest minister sees opportunity,” I felt compelled to write. I believe a sawmill in Campbell River would be a wonderful idea. Further to that I would suggest maybe to offer a company a Tree Farm License with a supply of trees to mill into lumber. There is one called TFL 47 that was given to CrownZellerbach in 1950 in exchange for jobs. This timber was to be processed at a pulp and paper mill to be built in Duncan Bay. In 1956, they added a sawmill to also produce lumber instead of turning all this fibre into pulp. This mill ran until 2008. While forest fire season wasn’t busy here in Saskatchewan, crews and equipment were frequently deployed to other jurisdictions. The 387 fires crews dealt with throughout the season is slightly more than last year, but comes in below the province’s 10-year average, which is over 400. …199 fires were started by lightning strikes and the other 188 were determined to be human caused. Wildfire Management Director Steve Roberts says that is a problem his staff takes very seriously. It will be tough sledding for anyone trying to do business with the B.C. government next Wednesday as thousands of its unionized workers are set to walk off the job. …The Professional Employees Association, which represents over 1,200 licensed professionals in B.C.’s public service, including mines inspectors, forest research scientists, bridge engineers, foresters and more, will also take part in the strike action next Wednesday. It’s zero hour for leaders in the Atikamekw First Nation. Last month, chiefs in three impoverished Atikamekw communities gave the provincial government an ultimatum: resolve a 33-year-old land d…. About 30 people in the Aboriginal reserves set up checkpoints to prevent Kruger’s trucks from carrying lumber through their territory in June and early July. They also blocked all CN Rail line traffic passing through Atikamekw land. ROUYN-NORANDA – Pauline Marois offered assurances Wednesday that a Parti Québécois government would maintain the current Liberal government’s Plan Nord to develop the natural resources of northern Quebec. “We agree with northern development,” the PQ leader said in a local Radio-Canada radio interview, adding the caveat: “We don’t see it the same way.” Marois explained that under the mining-royalty regulations adopted by the Liberal government, 10 of 19 mining companies in the province pay no royalties. Lightning-caused fires continue to be a concern for Ministry of Natural Resources fire crews. Eight new fires were reported over the past two days in the districts of Dryden, Fort Frances, Kenora, Nipigon and Sioux Lookout. Fire information officer Deb MacLean said Wednesday that there has been a heavy concentration of lightning strikes across the central and southern portions of the region over the past several days, and more lightning-caused fires are predicted to flare up as the weather clears and temperatures rise. BILLINGS, Mont. — Firefighters struggled Thursday to gain control of major Montana wildfires that burned houses and caused injuries, even as crews rushed to tamp down new blazes before the flames spread. The toll from the latest spate of fires remained uncertain. But at least three evacuation orders were in place and well over 150 homes were threatened by blazes that in some cases burned unchecked. COVELO — Firefighters made good progress Thursday on the North Pass Fire, burning northeast of Covelo on the west side of the Mendocino National Forest. 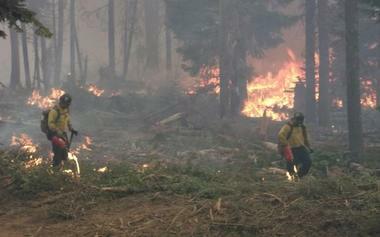 Containment jumped 9 percent to 37 percent, and the fire burned less than 200 acres Thursday for a new total of 34,308. Four homes and seven outbuildings have burned. The fire that started by lightning on Aug. 18 is burning north by long-range spotting, fire crowning trees and torching of trees, fire officials said, and is producing a lot of smoke. Two large wildfires flared in Oregon on Tuesday afternoon, one in the southeast corner of the state and the other in Eastern Oregon. The Parish Cabin fire, located 15 miles northeast of Seneca, was reported at 2 p.m. Dozens of firefighters were mobilized to fight the blaze, running through timber, heavy fuel and dead branches and shrubs littering the steep and rocky terrain. The Grant County Sheriff’s Office ordered the evacuation of about two dozen people staying at campsites and hunting camps in the area of the Strawberry Mountain Wilderness. Bow hunting season opened on Saturday. A fund set up by the Colorado State Forest Service will provide tree seedlings that will be planted on lands most severely impacted by wildfires and other disasters. Fund administrators hope to raise at least $500,000 to plant at least 1 million seedlings over the next decade in critical areas burned by recent fires. After this summer’s fires, the fund expects to target areas that directly impact important watersheds and provide the most public benefit, including forest land burned by the High Park fire, where the loss of trees and other vegetation has already led to runoff and erosion that has damaged slopes and polluted the Cache la Poudre River with ash and sediment. GLENWOOD SPRINGS — The U.S. Forest Service is proposing to reduce the amount of land in the White River National Forest that can be leased for oil and gas production, and it aims to limit surface disturbance on a greater number of acres, according to a plan released Wednesday. The Oil and Gas Leasing Draft Environmental Impact Statement will dictate where drilling can occur in Pitkin County as well as portions of Garfield, Rio Blanco, Gunnison and Mesa counties. It also will determine where “surface occupation” such as road building and tree cutting can occur. Forests New South Wales says it is gearing up for a tough bushfire season along the north coast. It says it could be the worst season for forest fires since 2009. The Forests NSW North East Region operations manager Tom Newby says there has been a rapid decline in the moisture content of forests between Macksville and the Queensland border in the past month with little rain. Gisborne District Council’s is taking legal action against a forestry company under the Resource Management Act. It’s lodged a prosecution in the District Court against Hikurangi Forest Farms, relating to forest roading and harvesting activities carried out earlier this year at Waimanu Forest. The Council alleges the company breached several conditions of its resource consent for harvesting – that forestry roads were significantly wider than consented, batter slopes were larger, and as a result there were significant downstream effects on water quality of the Pouawa Stream. Control of Tasmania’s mammoth forest estate is shaping as a key battleground in the State Government’s plan to overhaul Forestry Tasmania. The Government has not decided who will control Tasmania’s 1.5 million hectare forest estate. The Resources Minister, Bryan Green, says deciding whether Forestry Tasmania will retain control over is one of the most crucial issues to sort out. The Deputy Premier Bryan Green says he will consult stakeholders. A 200-year-old tree on a Wiltshire estate has been officially declared the tallest oak in the UK. The 132.5ft (40.4m) English oak, in the grounds of the National Trust Stourhead estate, was measured by an expert on behalf of The Tree Register charity. Standing in a clump of tall oaks, the tree’s growth has been put down to rich soil and its need to compete for light. Alan Power, estate manager at Stourhead, said having the tallest oak in the country was “very special”. WHITECOURT, AB,- Millar Western Forest Products Ltd. announced today that it will proceed with construction of a $42 million bioenergy facility at its bleached chemi-thermo-mechanical pulp (BCTMP) mill at Whitecourt, Alberta. The project will involve integration of anaerobic hybrid digesters (AHDs) into the BCTMP mill’s existing aerobic effluent treatment system. The AHD units will recover organic material from the pulp mill’s effluent stream and convert it to a biogas. The Northern Bioenergy Partnership is curtailing some of its activities but is not folding as the north’s voice for turning wood into energy. Sources close to the organization have confirmed that the board of directors is set to announce cutbacks along with a new plan going forward. The financial buy-in from forest industry companies has not met with initial expectations, requiring the organization to reevaluate its ambitions for promoting this growing sub-sector of the forest industry. Part of the downsizing is the loss of executive director Elissa Meiklem. A NEW study conducted by researchers from CSIRO and the Department of Agriculture and Food (DAFWA) suggests industrial plantation forestry could potentially contribute towards Australia’s national target of reducing greenhouse gas emissions (GHG) if a carbon price is in place. The study found the expansion of new plantation estates into cleared agricultural land is not economically viable without a carbon price, largely due to the high costs of purchasing land.